The TrucBrush concept was born when Jim Burns was challenged by his client, a regional facility of one of the largest motor carrier companies in the United States to address a serious safety and operational inefficiency issue. As their snow provider, the head of facilities was hoping Jim could offer a better method to remove the accumulated snow and ice from the rooftops of their trucking fleet. The safety of the client’s employees and general roadway traffic were of critical concern to them. The facility currently relied on an antiquated rolling ladder and labor-intensive roof rake system to clear the snow from the truck’s tops by their drivers. It must be safe for the operator who is removing the snow. It must clean the truck surface better than any other solution. It must easily integrate into the client’s fleet environment. It must be capable of being outsourced to a private contractor, as the facility may not have the capacity or flexibility to perform. What resulted is today known as The TrucBrush® — a mobile solution that provides a safer, faster and more efficient means for removing accumulated snow and ice off the tops of trucks without requiring significant infrastructure investment and year-round dedicated facility space. To deliver a safer, more effective and economical solution for clearing accumulated snow and ice off vehicle rooftops that improves both facility and roadway safety. Make a positive and lasting impact on one of the trucking industry’s most challenging winter issues today—namely the accumulation of snow which can blow off truck rooftops and become a safety hazard to other drivers and vehicles, as well as, posing a safety risk to the personnel who physically remove the accumulated snow from vehicle rooftops. 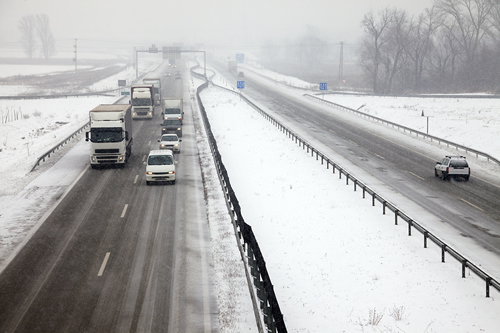 To create safer environments for truck drivers, facilities, and the general public on roadways throughout the world’s snow belt areas. To provide a fast, efficient and economical solution to one of the most challenging issues in the trucking industry. To offer snow service providers and other approved vendors the opportunity to engage facility owners in a strategic partnership that provides an effective service methodology and solution for a high safety risk operation in clearing snow and ice from vehicle rooftops. At TrucBrush Corporation, public and private sector safety is a leading force in our product design and snow service methodology. Our team works closely with facility managers, approved facility service vendors, trucking and busing companies, and those in safety risk management to achieve our snow removal service methodology—we call this delivering strategic relevance for our clients. TrucBrush’s corporate management, manufacturing and sales processes, training and after-sale service encompasses one of our company’s greatest values—integrity. At the core of everything we do—from engineering to manufacturing to sales and service, our team works hard to exceed client expectations. Integrity is more than delivering on promises; it’s what drives success.